The surface of the North Fork River was calm as I pushed the canoe off the gravel bar and into the shallow water at the Hammond’s Mill river access. The power of the moving water wasn’t apparent until a few yards downstream, where the river is funneled into a narrow curved channel. The canoe shot forward before I could get balanced and pick up my paddle. Then I could understand how the river was able to turn the massive mill stones of the old grist mill that once stood near this spot. As the stream veered to the right, I innocently expected to see the canoe turn with it. But the bow stubbornly pointed toward the left bank, and I started drifting sideways. A stroke of the paddle on the left side slowly swung the canoe around. But it also moved me faster toward the bank! Before I could complete the turn, the bow crunched into a mass of roots on the bank. The current suddenly jerked the other end around. The rushing water hit the canoe broadside. Cold water came pouring over the other side as it tipped. Shifting weight, I quickly righted the canoe. Too late. I was sitting in six inches of water, with the life cushion and waterproof containers floating around my knees. It was an overcast day with rain threatening, so l felt lucky there was no one else around to witness this debacle as I dumped the water out of the canoe, rearranged my gear and made a fresh start. This was the awkward beginning of a one-day solo float trip on a short stretch of the North Fork River in Ozark County, Missouri, in the spring of 1981. Yet there was a special inspiration behind this writing project, beyond the “playground” aspects of the Ozarks that are plugged in many publications. There was a desire to portray the float trip as something more than a cheap vacation. Many of the people we see racing along the surface seem to be missing a lot of what the river has to offer. There are other dimensions of the river that are often overlooked, which can enhance the floating experience. Yes, there are some excellent published canoe guides, but even they deal mostly with the fishing and floating characteristics of the water. It’s also important to learn about the plants, wildlife and historical sites that will be seen along the way. Only then does it seem worthwhile to allow the current to carry the canoe at a quiet, leisurely pace. The river is seen as something very much alive. There is a subtle pleasure in becoming part of it, respecting it and letting it tell its own story. A detailed topographical map also shows that the river and its immediate shoreline cannot be separated from the hollows, ridges and caves at every turn. They are interesting not only for their geological kinship to the river but for the pioneer families they are named for — names like Collins, Gunter, Kelly, Hodgson and Guthrie. The dramatic stories told by their descendants added a lot of meaning to this float trip. By the time it was over, the North Fork had become more than a winding ribbon of water. It was a living tapestry, in which man and nature, space and time, were interwoven.Hammond Mill, shortly before it was torn down in the late 1930’s. 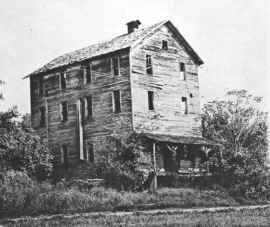 Hammond Mill, shortly before it was torn down in the late 1930’s. Hammond’s Mill river access, where many canoeists put in, preserves only the name of the water-powered grist mill that once turned locally grown wheat, corn and oats into meal and flour. Use of the site for water power dates back to 1856, when a man named James built a log mill on a bluff on the west bank of the river. James was hanged nearby by bushwhackers at the close of the Civil War, and for many years a marker told where his grave could be found. The property was acquired after the war by a man named Poole, who replaced the log mill with a frame structure. This mill burned in 1876, but was replaced the following year. Ox teams were used to haul stones and timbers for a dam, to provide a better head of water for the undershot wheel. In 1902 a man named McCabe established a post office and general store near the mill. This mill continued to operate until it was washed away by a flood in 1904. Jim Duffy, the owner at the time, sold the property to Tom Hammond, who had another mill built on higher ground in 1907. After Hammond’s mill ceased operation in the early 1930s, the milling equipment was removed, including the huge stone buhrs said to have been imported from France. The three-story structure quickly deteriorated and was demolished a few years later by developers who had a plan (which they later dropped) to build a dam on that part of the river. Old mills like this, whether preserved or long decayed, remain as symbols of the Ozarks pioneer heritage. But they were more than pieces of machinery. They were the hub of the economies of the first wilderness settlements. Much is owed to the skillful mill wrights and enterprising millers who made this possible. A new bridge a few hundred yards upstream from the national forest public campgrounds near Hammond’s Mill whisks motorists high over the water today. Old timers tell what it was like when the only roads along the river were rutted wagon tracks, and bridges and ferries were unheard of, when long, hard journeys were involved in getting to the half dozen mills that operated at one time or another along the North Fork. Beyond the rushing waters below Hammond’s Mill, the river returns briefly to a wide, calm expanse of water, with rugged limestone bluffs towering above. Some rock formations project over the water. Every ledge is crowded with mosses, broadleaf plants and colorful wildflowers. Spring water trickles from fractures in the rocks. Many eons have passed since these limestone deposits were formed in the bed of an ocean, heaved up, then imperceptibly worn away to form the walls we see today. Untold generations of living creatures have found shelter in their crumbly niches. As I drifted with the current, I found that the air above the water also flows along with the river, with noticeable pools and eddies that are shaped and channeled by the surrounding terrain. Several times I drifted into fragrant pockets of air that flowed out of lush groves of oak, dogwood and sycamore trees along the banks. Near waterfalls, the air picked up the pungent smell of aquatic vegetation. Nearby bottom lands added the flavor of newly mowed hay. I had almost passed Blue Springs before I saw what it was. By now I had learned the trick of turning the canoe without taking up the whole river (paddling backwards on one side), so I worked my way back against the swift current for a closer look. The spring obviously gets its name from the bluish haze of the frigid water as it wells up from the sides of a picturesque circular cove. The cold water and the shade from tall trees on the surrounding ledges gave the air a noticeable chill. Several stretches of deep, smooth water gave a good view of the many species of fish found in the river. Suckers took little note of the canoe as they probed over snail-covered rocks on the bottom. Striped bass darted away when pursued closer to the bank. Nervous schools of perch scattered and regrouped. Fish of all sizes broke the water to feed on hovering insects. A lively rippling of the water ahead signaled I was approaching the lower edge of one of the many limestone ledges that make up the riverbed as it stair-steps its way down to Lake Norfork near the Arkansas line. This section, below a tributary called Crooked Branch, has been known from pioneering days as Cow Ford, one of the dozen or so spots along the river that were used for low-water crossings. One of the area residents I met later was Walter Collins, 91, who was born a mile or so from Cow Ford. Collins Ridge was named for his grandfather, Ephram Collins, who homesteaded there before the Civil War. In those days, Ephram supported his family largely through hunting. He often told his children and grandchildren about the time he heard the terrifying squall of a panther, or mountain lion, behind him as he was tracking game across the river. Cocking his muzzleloader, he kept walking as fast as he could until he decided the panther wasn’t stalking after all. Later he found the carcass of a farmer’s hog that had been tied to a tree and died from the heat. He saw that something had been feeding on it, and he figured that’s what saved him. Another time, Grandpa Collins and another farmer had to go to Hammond’s Mill with a load of corn. 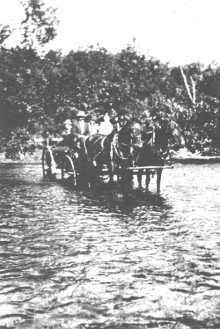 After struggling through Cow Ford with the heavily loaded wagon, they found the bank was too steep for the yoke of the oxen to pull the rig up out of the water. Collins jumped out of the wagon into the water. The load was still too heavy. “Throw one of those sacks of shell corn over my shoulders. I can carry it,” he told his companion. This lightened the wagon just enough for the oxen to finish the pull. Since trips like these were major undertakings, the two men stayed all night at the mill so they could return home with their flour and meal the next day. Just beyond Cow Ford, the river divides, forming one of the many small islands encountered on the trip. It was hard to tell which channel was the deeper, so I landed on the island to get a closer look and talked for a while with four canoeing couples who had stopped there to fish. The channel I finally chose turned out to be deep enough, but several submerged rocks gave the canoe a jolt as it went over them. It helps to have another person along to keep a lookout for such hazards. The canoe was propelled into another narrow channel that careened sharply to the right as it collided with the water coming from the other side of the island. The canoe was tossed about by the turbulence, but I sailed through with regained confidence. Then an earlier pattern was repeated — a long stretch of calm, deep water bordered by ancient bluffs. I drew up to a gravel bar to relax and enjoy the view. No luck. The trashy remains of an abandoned camp site just couldn’t be ignored. Beer cans, aluminum foil, food wrappers and cigarette packages had been dropped and forgotten. Ashes in the fireplace were still warm. As I put the trash in a sack in the bow of the canoe, I wondered if I would meet the thoughtless perpetrators of this mess downstream. Why did they bother to even come here if the beauty of the river didn’t mean anything to them? The people I had passed earlier caught up with me. It had started to rain, and they all took out ponchos and continued fishing. Another group of floaters downstream had found shelter on a gravel bar beneath an overhanging bluff, and, having no rain gear, I decided to join them. Everyone pooled scraps of dry paper and managed to start a small, smokey fire with dead twigs and drift wood.At the old swimming hole in the 1930s. After the rain let up, I was able to set out again. A few more turns led to a deep pool surrounded by flat rocks. I recognized this as the old swimming hole Walter Collins had talked about. It had been a popular gathering place for generations. To appreciate this requires picturing a time, many years ago, when it was rare to see anyone floating the river. 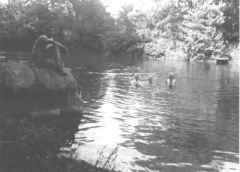 Groups of boys who sneaked away from hot chores for cool swims wore only their “birthday suits” as they dove from rocks and frolicked in the water. People seldom go there anymore, and the old road leading to the swimming hole is grown over with trees now, Collins said. Below the swimming hole is another crossing known as Gunter’s Ford, named for Sherman Gunter, a pioneer farmer whose land bordered the west side of the river. Merchants from Dora and other communities west of the river used this crossing to haul lumber to West Plains and to bring back sale goods. Roads from other fords downstream joined this one on the east side of the river and continued on through Pottersville. Years ago, anyone who wanted to cross the river, to fish or to water his stock had free access to the riverbanks. Also, the land that was not under cultivation was considered open range, populated by roaming herds of cattle and half wild hogs. Numerous “squatters” eked out livings in isolated hollows. To keep the woods open, farmers would burn them over every spring. These practices, combined with unrestricted hunting, decimated the wildlife population by the early part of this century. Two huge springs originate from what was the Gunter farm and contribute their flow to the river below Gunter Ford. Everyone called them Double Springs then. A water-powered grist mill once turned at the mouth of one of the springs. It was owned by Alva Hodgson, who had previously built the Hodgson Mill on Bryant Creek, which, among others, is still in operation today. A big flood in 1915 washed the mill away, and all that remains today are the concrete footings. People still tell about the pumpkins and mill parts they found strewn about the bottoms after the flood waters subsided. The Gunters, who later ran a steam powered sawmill in one of the hollows, had to move their equipment to higher ground during one flood. They tried to save one big saw log by chaining it to a stump. When they came back later, the log, chain and stump had all vanished. Double Springs also used to be the scene of big Fourth of July picnics that drew people for miles around, according to Birda Gunter, now of West Plains, who was married to the late Clarence Gunter, one of Sherman’s sons. 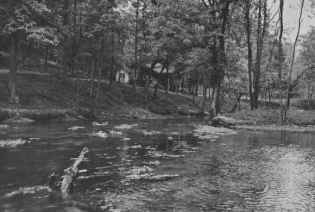 Rainbow Springs (formerly Double Springs) and the original Mahaffey lodge, in the 1930’s. In the late 1920s, Birch Mahaffey of St. Louis bought the Gunter property, fenced it, and started to develop the springs into a commercial fishing resort. That was when it became Rainbow Springs. For easier access from West Plains, Mahaffey had a wooden bridge built across the river at Gunter Ford. Natives who had witnessed floods on the North Fork raised their eyebrows when they saw this “cornstalk bridge,” with its numerous pilings inviting the accumulation of floating debris. When someone asked young Clarence Gunter how long he thought the new bridge would last, he pointed to a nail high on the trunk of a tree and said, “I’ve seen the water get that high.” It was eight feet above the bridge. A heavy rain came the day after the bridge was finished, old timers recall. In the flood that followed, the bridge was swept away like a toy. The loss nipped Mahaffey’s commercial venture in the bud. But his descendants have continued to use Rainbow Springs as a private weekend resort. Full-time caretakers (including Clarence and Birda Gunter from 1942 to 1971) have farmed the land and made sure that hunters and river users observe the many “No Trespassing” signs. One by one, other farms along the river were fenced and restricted to private use. A limited number of public access points and public campgrounds are located on stretches of the Mark, Twain National Forest that border the river, however. I found that most of the landowners, while concerned about the increased volume of river traffic, are tolerant and even friendly toward canoeists as long as they limit their stops to the gravel bars and take their trash with them. Turtles sunning themselves on a half submerged limb slid into the water as I approached, before I could identify them. There was a similar problem with a large blue-gray water bird that kept moving downriver ahead of the canoe. There were few suitable stopping places for getting closer looks at flowers. The easiest study was made of a kind of water lilly with yellow blossoms found in several shallow backwaters. Large vultures also formed unmistakable silhouettes in the tops of several dead trees. One thing was certain, most of the plants and wildlife close to the river are very different from those found in the uplands of this same general area. This was part of a unique, delicately balanced ecosystem. A few hundred yards past Rainbow Springs, where the combined waters rush over a boulder-strewn bottom, the canoe ran into a shoal of water, the roughest encountered so far. But there appeared to be no danger for anyone who is alert and holding the canoe on a steady course. George Eckart and family crossing Kelly Ford, 1913. This is just above Kelly Ford, another major crossing point before the days of bridges and fences. It was named for Henry Kelly, who farmed the neighboring bottom land in the early 1900s. The story is told of a team of horses that drowned at Kelly Ford when the driver ignored the warnings of neighbors and tried to take them across during high water. Usually, when the water got over about mid-thigh, there was no question in anyone’s mind that it was too dangerous to cross. There was nothing to do but wait – which might be hours or even days. Walter Collins’ sister-in-law, Grace Paul Kelly, 92 was married to John Kelly, one of Henry’s sons. While visiting here from Colorado recently, she told of times when high waters came up as far as their front porch in the hollow. Whenever Kelly Ford was too deep to cross on foot, they often would hear neighbors hollering from across the river asking Mr. Kelly to bring them across in his big john boat. Across the river from Kelly Hollow, below Rainbow Springs, is “Tater Cave.” Early settlers discovered its constant temperature and humidity made it an ideal place to store their sweet potatoes through the winter. As a young girl, Mrs. Kelly had the job of fetching potatoes from her family’s barrel in the cave. Ducking under the low entrance with a burning pine knot, she had to look out for snakes that found he cave an equally ideal place to spend the winter. There are several other large caves in the neighborhood that adventurous youngsters liked to explore as far as their pine knots would last. They usually tied a string to a tree near the entrance, unrolling it as they went so they could find their way back. But one group of youngsters who went into a cave on the Kelly property got “claustrophobia” squeezing through a narrower passage and emerged badly frightened. After that, Mrs. Kelly decreed there would be no more expeditions into the cave while she lived on that property. A tamer and universally enjoyable pastime was fishing. There were no trout in the North Fork until the owners of Rainbow Springs built a hatchery and started stocking them. But there was plenty of sport and good eating from carp, perch, goggle eyes, catfish, pike, bass and other fish that are native to the river. Crayfish, or “crawdads,” were delicacies for many river people. Eels used to be common, but the dams built downstream make it impossible now for the eels to migrate upstream to spawn, some say. Among the fishermen in that part of the river were George and Otto Eckart, brothers who homesteaded land along there in the 1890s. As artists in Chicago, they had been friends of Michael Brand, founder of the fruit empire at Brandsville. At Brand’s invitation, they came down one summer to pick peaches. They fell in love with the river and brought their families back the next year. They moved back to Chicago a few years later, but they kept the land and returned for extended vacations each year. Their attachment to the river has endured for succeeding generations, as it has for the descendants of other pioneer families. Crossing the North Fork in a gigging boat, 1920s. During hard times, many families or their offspring were forced to leave their homes along the river and seek jobs elsewhere. But it’s amazing how many of them later found their way back as soon as circumstances allowed. 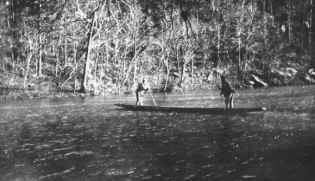 The popularity of gigging, or spear fishing, for suckers at night gave rise to the unique Ozarks gigging boat. It was a long, flat-bottomed boat that was propelled easily up and down the river with long poles. To keep the seams tight it was never taken out of the water. The classic gigging boat, according to the Eckarts, was made from just three tapered pine boards -one 16 to 18 inches wide for the bottom and two 14 inches wide for the sides. Of course there had to be some splices lengthwise when the boats got up to 32 feet long. But it would be hard to find boards wide enough to make such boats today. The giggers would set a “fire jack” (a wooden platform covered with wet mud) across the middle of the boat. Burning pine knots would be stuck into the mud like candles in a cake, and the light would draw fish near the boat at night. Every so often in summer, the neighbors held big fish fries in Kelly Hollow. After gigging all night, the men would come back with their boats filled with suckers. Their faces still black with soot from the burning pine knots, the tired men would rest in the shade while the women fried the fish and the children took turns churning the ice cream. There were always bawling babies and flies everywhere, but everyone had a great time, the Eckarts remembered. At Casey Ford, less than a mile below Kelly Ford, I came to a concrete bridge with the name McKee painted on the upstream side. This, I learned, was constructed for private use in 1974 by Warren McKee, 61, who owns property on both sides of the river and runs a sawmill on the old Kelly place. His father, Arthur McKee, moved his family to the river from Pottersville in 1932. Neighbors and relatives questioned his economic judgment, but the land was cheap and had plenty of marketable timber on it. Although the Depression years kept everyone’s attention mostly on the immediate problems of survival, McKee points with pride to the benefits of more careful land management since the days of the early settlers. The woods are now populated with turkey and deer, something his father rarely saw. Gardens and livestock meant people who subsisted along the river usually had enough to eat, McKee said. But as recently as 25 years ago life was almost as hard as it had been for the original settlers. Water was hauled long distances from springs. Clothes were washed by hand on scrub boards. Because there was no refrigeration, the kitchen ranges had to be fired up even in the heat of the summer to can all the meat from hogs when they were butchered. The last chores of the day were done by the light of kerosene lanterns, before everyone fell into exhausted sleep. Today, even with greater material comforts, it’s still hard for river residents to make a living. Beyond a handful of farmers, most local people now fit into three categories: retirees, weekend cabin owners and canoe outfitters. An interesting exception is McKee’s nephew, Myron McKee, 29, who moved back here from California with his wife, Ann, in 1977. They are building their own home across the river, using precut logs from the McKee sawmill. They are a happy-looking couple, although the North Fork holds some poignant memories for Myron. When he was nine years old, his father was drowned while trying to cross Kelly Ford on horseback during high water. Within a year, the family farm was sold and the family moved away. Myron’s mother wanted to leave to start a new life, but he never stopped thinking of the land along the North Fork River as home. As he was growing up, he dreamed of returning someday. But Myron and Ann had to consider the limited economic opportunities in the area. Their experience packing fruits and vegetables during the summer in California suggested a solution. For the last several years they have earned enough money through seasonal work elsewhere to allow them to live on the river the rest of the year. When I talked to them, they were getting ready to leave to pack tomatoes in Arkansas and perhaps move on to California for the fruit harvests. Upriver, just about every group of canoeists I met asked in worried tones how far it was to (shudder) The Falls, that nemesis of floaters that manages to devour about one or two canoes per weekend. The Falls, located just below Casey Ford, actually present no great hazard. It’s a short drop, with several clear openings between the rocks. Trouble occurs only when approaching canoeists get panicky, decide to go through a different channel at the last second and end up drifting sideways into some rocks. The pressure of the water can hold the canoe against a rock like a vice and even fold it up like a jackknife. A mile beyond The Falls, just above Guthrie Ford, an old metal roofed log house is visible from the river. It hasn’t been lived in for several years. But later I traveled several miles of backroads to meet the original owner, Redman Hensley, 73, who lives with his wife in a mobile home a short distance away. This was a particularly fortunate discovery, for here was a living example of the old-fashioned ingenuity that early pioneers depended on in the face of scarcity and isolation. His father, James Hensley, had traded 160 acres of land to the west for these 80 acres along the river in 1915 because he was interested in water power. But being advanced in years when the move was made, the elder Hensley was able to get only as far as building a mill race before his death in the mid 1920s. It fell to Redman, only 15 years old at the time, to complete his father’s ambition. He had only eight years of formal education, but he also had inherited his father’s mechanical aptitude and self-confidence. Over a period of several years, whenever his farm work allowed, he carefully surveyed the banks of the river and charted the rise and fall of the waters. At night, he studied science books he borrowed from a school teacher friend and taught himself the basics of mechanics and electricity. Using many parts salvaged from old cars and tractors, he eventually built an undershot water wheel at the end of the mill race below his house. The end of the shaft had a beveled gear that transferred motion to another shaft running uphill to a mill house, turning stone buhrs that ground grain for himself and neighbors. Later, he connected an electrical generator to the shaft and had a business of charging up people’s batteries for their radios and lights. After about 15 years, the bearing and gears of the water wheel finally gave out and the whole thing sort of fell apart, Hensley said. He substituted a gasoline engine and continued running the grinding mechanism for several more years. Today only a few metal fragments remain as evidence of where the water wheel and mill had stood. Living today without electricity, he said he would like to generate his own power again. But he wouldn’t use water power anymore. Always reading and experimenting, he’s going to see what he can do with solar energy, he said. One of the early settlers east of the river between Guthrie Ford and Blair Ford was James Trump, who moved here from Oregon in 1908. One of his sons, Walter Trump, 93, now of West Plains, remembers harvesting wheat with a grain cradle and taking it downstream to a mill at Patrick Ford, where Patrick Bridge is now. He also made his own apple cider. Both the cradle and the cider press are family heirlooms. 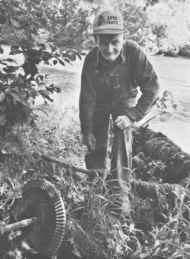 One of Walter’s favorite pastimes was setting trot lines in the river for eels, which were baited with chunks of rabbit meat. The eels were skinned and fried, just like catfish. “Those were the good old times . . . then. I don’t think I’d want to see them again,” is Walter’s assessment. Once, while crossing Blair Ford in a buggy during high water, his wife had to hold on to the children to keep them from being swept away by the current. During the drought years of the 30s, when many springs went dry, he and other farmers would drive herds of cattle and hogs down to the river for water. The river had more than economic importance. When Walter and his brother went to Kansas in the summer to find work during the wheat harvests, they were always glad to get back and see the beautiful hills along the river again. In 1923, after one stay in Kansas, they returned to an even more pleasant sight. A man named Young had completed a bridge across Blair Ford, the first on the North Fork River. This was destroyed by a flood ten years later, however, and until the present bridge was built in 1935, residents had to go back to fording the river. One of the people helping to build the new bridge was Beryl Pettit. 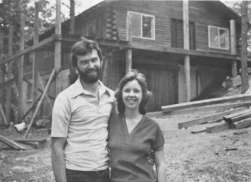 He and his wife Betty now run a canoe rental and campground at Blair Bridge, one of the first on the North Fork. The image of a tapestry of interwoven lives seemed all the more appropriate when Betty Pettit explained that she is the sister of Warren McKee’s wife, Naomi. They are both natives –granddaughters of James Trump. The Pettits, who returned to live on the river after being away many years, come across as typical, friendly Ozarks people. They love the land and the river, yet maintain an open, helpful attitude toward the weekend canoeists. They enjoy serving the 95 percent of river users they see as “good people who respect the river” and try not to get too vexed at the other five percent. This perhaps summarizes the situation of the rivers today. The uses people have made of the river — for food, transportation, water, power, recreation — have changed over many generations. But there is general agreement that the river is there to be used and enjoyed The only question is how much use the river’s limited resources can absorb. It seems to come back to the kinds of attitudes people bring with them. If a float trip is thought of as a brief visit with a good friend and we act accordingly, we are sure to be welcomed back again with a smile.